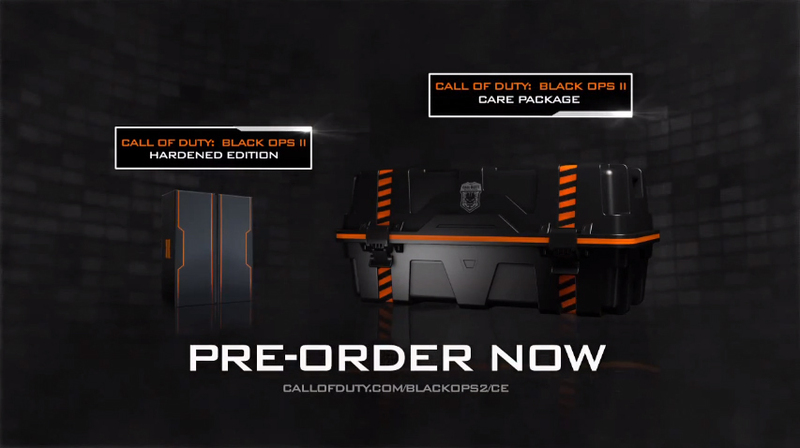 Today, Activision revealed their Collector's Editions for upcoming shooter, Call Of Duty: Black Ops II! The Care Package and Hardened Editions offer a variety of digital content and physical bonuses. -Remote Controlled MQ-27 Dragonfire Drone – Command cutting-edge technology, exclusively for this once-in-a-lifetime combat collection. - Nuketown Zombies Bonus Map – Battle hordes of Zombies in this beloved 1960s nuclear neighbourhood. - Collectible 2-Sided SteelBook - Limited edition game case featuring exclusive artwork. - (2) Challenge Coins – Limited edition challenge coins that serve as your key to exclusive digital content. - Weapon Camo – Rank-up in style with an exclusive multiplayer weapon skin. - (2) Player Card Backgrounds – Liven up any killcam with two exclusive player card backgrounds, inspired by Nuketown 2025 and Zombies. - Official Call of Duty: Black Ops II Soundtrack – A digital copy of composer Jack Wall’s epic in-game score with theme by Trent Reznor. - Xbox LIVE CLAW Avatar Prop – An exclusive avatar prop, deployable to a dashboard near you. - Xbox LIVE Zombies Avatar Costume – Show off your pride with an avatar costume built exclusively for fans of the Call of Duty undead. -Nuketown Zombies Bonus Map – Battle hordes of Zombies in this beloved 1960s nuclear neighbourhood. - Collectible 2-Sided SteelBook® - Limited edition game case featuring exclusive artwork.